A cosmic team-up of planets and the thin crescent moon is dazzling skywatchers around the world this weekend, and the celestial sky show is just getting started. The planets Venus and Jupiter dominate the western evening sky at sunset on Saturday and Sunday (Feb. 25 and 26), with the crescent moon hovering nearby. The planet Mercury joins the cosmic trio briefly just after sunset before slipping below the horizon. The planet Mars is also making its own appearance in the evening sky, but rises in the east a few hours after sunset in its own solo celestial show. The sky maps of Jupiter, Venus and the moon here show how the bright objects, as well as Mars later, will appear in the night sky. Skywatchers have already been amazed at the sight of Jupiter and Venus shining together with the moon this week. "To see the three brightest objects in the sky form a perfectly straight line in the west was a very beautiful and very powerful sight that I will not forget," skywatcher and nature photographer William Ott told SPACE.com in an email. Ott snapped photos of the planets and moons from a spot just outside Woodstown, N.J.
On Saturday and Sunday, the moon, Venus and Jupiter will appear as a skinny triangle of celestial lights. However, the triangle will have a slightly different configuration on each night. Tonight, Jupiter, Venus and Mercury will align in a diagonal line (with Jupiter at the top) with the moon appearing just above and at the right of Venus. On Sunday night, the cosmic line-up happens again, but this time the moon will appear higher in the sky, just to the right of Jupiter. "This arrangement will be visible all around the world, from city and countryside alike," Phillips explained in a NASA announcement. "The moon, Venus and Jupiter are the brightest objects in the night sky; together they can shine through urban lights, fog, and even some clouds." Nature photographer William Ott snapped this amazing closeup of the crescent moon on Feb. 24, 2012 as it appeared from a woodlands area near Woodstown, N.J.
Planets aside, the moon is offering a dazzling sight of its own. The skinny crescent moon offers skywatchers a good chance to see the ghostly glow of earthshine — light from the sun that is reflected off of Earth to illuminate the dark portion of the moon in its current phase. 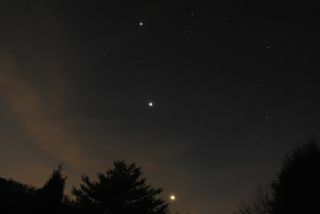 Meanwhile, Jupiter and Venus are steadily drawing ever closer together in the night sky. By late February, the two planets will creep within 10 degrees of each other in the sky; close enough that you can block them with a closed fist held out at arm's length. On March 12 and 13, Venus and Jupiter will be so close they can be covered by just your fingertips, according to a NASA video. f you snap an amazing photo of Jupiter, Venus the moon or any other skywatching target and would like to share it for a possible story or image gallery, please send images and your comments to SPACE.com managing editor Tariq Malik at tmalik@space.com.